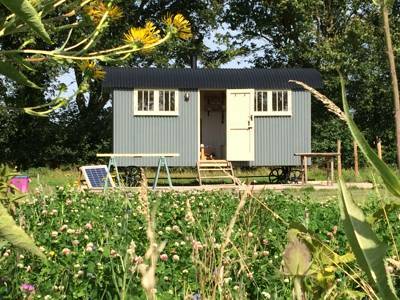 A beautifully equipped hut set in its own section of meadow in rural Suffolk. Whatever type of holiday you are looking for, our luxury glamping site situated in the scenic Suffolk countryside will have everything you need. The brand new Shepherd's hut is wonderfully spacious giving you plenty of room and proper comfortable beds too. There is a lovely full-sized double bed at one end of the hut and a sofa (which converts to a fun bed complete with tiny stairs for a child!) at the other. The hut is fully insulated and with double glazed windows and has a wood burner with plenty of logs to use. Besides the sofa, there are stools, a table, good storage space as well as lights powered by the solar panel. The hut has decking outside with chairs and a table for eating al fresco, a bar-b-q and a calor-gas cooker with plenty of utensils; if you prefer, you can use the 'safari' kitchen, which is great for cooking under cover. We have fruit and vegetable troughs dotted around the barn so that you can pick or dig your own if you want to - there is no charge for this and we very much hope you'll enjoy the delights of home grown produce. You also have free use of the communal pizza oven, picking from the nearby pots of herbs (we always aim to have basil available)! Adjacent to the barn is the 'Owl Cowshed', here you will find flushing toilets, showers, basins, mirrors (as well as your own hot water bottle for the cooler ends of the season) and washing up facilities with plenty of hot water from the solar panels on the stable roof (supported by an environmentally friendly wood-pellet boiler and two huge hot water cylinders). And tucked away outside beneath the rowan tree you’ll find the double woodland shower with proper hot water in a wooded area well screened by willow fencing.